The Clicgear Model 8.0 is very unique. The design started with many requests for us to do a four wheel cart from our loyal customers. 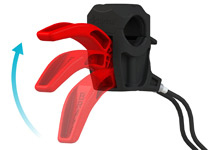 Most wanted to upgrade to something bigger and better from the Clicgear they already owned. The project started two years ago with the basics requirements and a long wish list of things we would like to do with the design. After two long years, we were finally happy with the design and started production on what will most likely be the benchmark for premium four wheel golf carts for a long time. 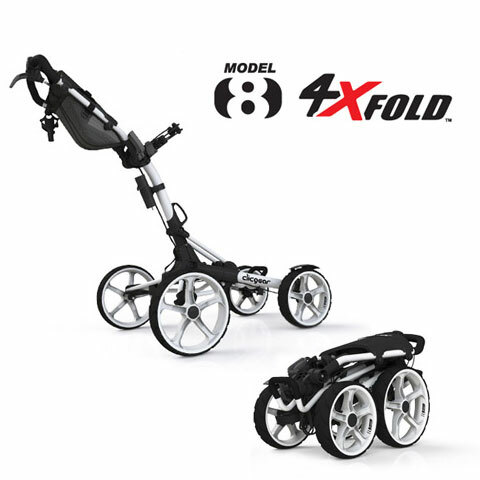 The Model 8.0 features our new and patented 4XFOLD™ technology that allows all four wheels to fold, making for a much smaller folded size. 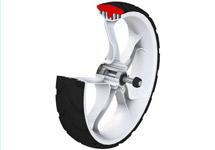 This also allowed us to make the front wheels open wider as well, for greater stability. You’ll also notice there is no ‘lawnmower’ type front axle to slow you down in tall grass. Two major design improvements on four wheel cart design include dual front brakes and dual front wheel alignment. 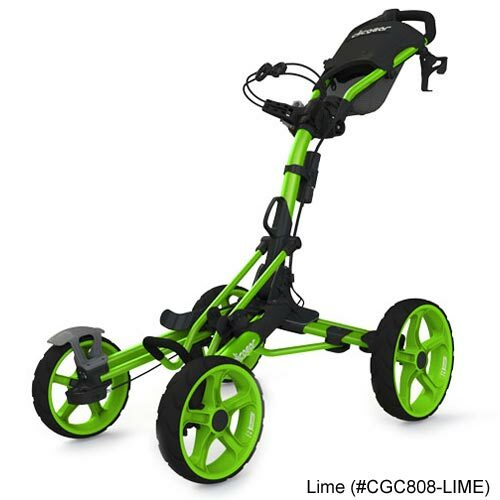 The dual front brakes allow for the cart to be quickly maneuvered around the green with the brake on. 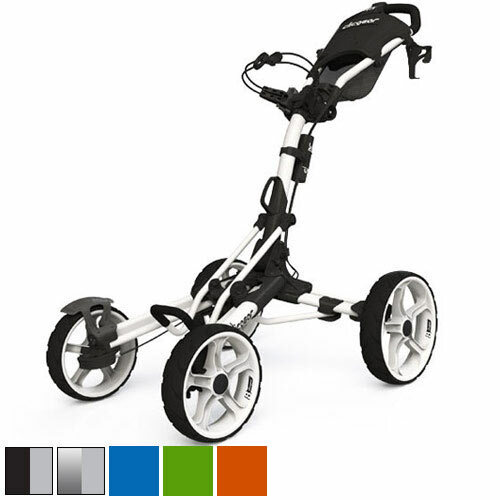 The Dual front wheel alignment makes this the first four wheel cart that can actually be adjusted to do straight. 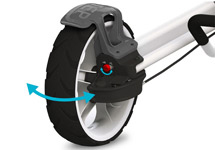 The Model 8.0 uses an over center type hand brake to operate the dual cable brake system. 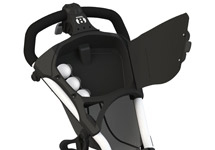 The huge console lid locks with magnets during play and locks with a durable strap during transport or storage. 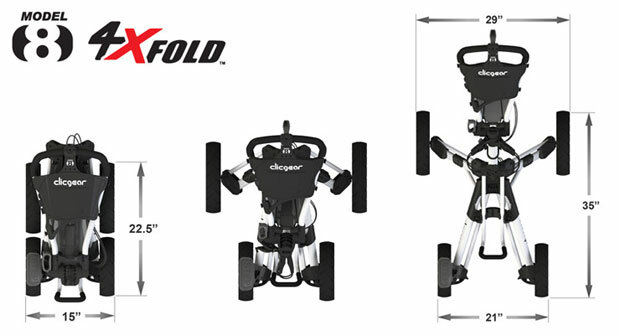 The all new patented frame on the Model 8.0 is unique with the only four wheel folding design on the market. No lawnmower front axles here. They have tested a lot of golf carts at Clicgear in the last 10 years. None have tested as strong and durable as this one. 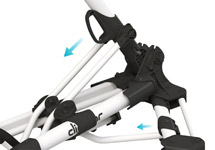 This little feature makes folding a breeze. 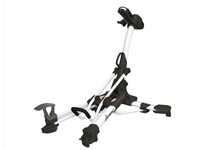 The step holds the cart in place while you fold or unfold the cart. It looks cool too. They are so impressed with this little feature. Finally a four wheel cart that can be made to go straight with the turn of a single screw. 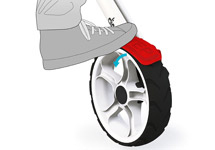 Designed with a goal of reducing the amount of materials required to build them as the main goal, without a loss of strength, these wheels are still strong and mould balanced.